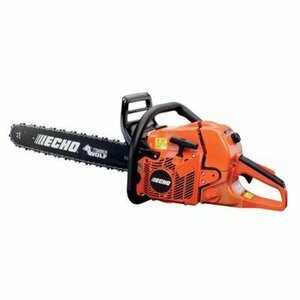 Echo CS 590 Chainsaw Reviews Better Than Rancher 460? What can you say about the Echo CS-590 Timber Wolf to do it justice? Maybe we could talk about the large engine, rugged performance and range of different bars it can take. That would certainly all be true, but this powerful beast deserves more of an in-depth review to find out just what it can do. What are the main features of the Echo 590 Timber Wolf? What is this G-Force air cleaning system on the CS-590? What maintenance will I have to do? What safety features does the Echo Timber Wolf have? We’re going to take a good look at this 20” gas powered chainsaw and find out just why many consider it to be one of the best choices for landowners. In fact, for anyone who needs a chainsaw that’s dependable, versatile and suitable for use throughout the year. Echo USA are always high on our list of recommended chainsaw manufacturers when it comes to quality, value and a decent range of saws to choose from. The Timber Wolf is a professional grade model with a range of top-level features that distinguishes it from other models in the Echo range including a see-through fuel tank, decompression valve plus a heavy-duty, two-piece mesh air filter. It can take a range of bars including the 20” one on the model we’re reviewing which makes it a saw that can be used for a variety of tasks around the homestead. Light duty work such as simple pruning and limbing may not be on the list of jobs you would use it for as it’s too heavy, but for any demanding job then the rugged CS-590 is going to work out very well. 59.8cc 2-stroke, professional grade engine delivers great performance for all tasks. Dual post chain brake for quick protection against kickback. Inertia and hand guard operated. Air shutter to prevent winter carburetor trouble. Can take bars and chains from a minimum of 16” up to 27” maximum for many different uses. Check the manual for the correct part numbers and combinations. Digital ignition makes starting easier and provides smooth acceleration. Decompression device to reduce cylinder compression when starting. Integrated throttle idle latch and choke also aid easy starting. Heavy duty spring anti-vibration system reduces vibrations at the handle. Side access simple chain tensioning with included T-wrench. Automatic, clutch driven adjustable oiler for different environments. Easy tool-less access to the air filter for quick maintenance. Two-piece heavy duty mesh filter is easier to clean. G-force air pre-cleaning system maintains clean air supply for the engine. Spark arrestor muffler prevents hot sparks from leaving the muffler. Bar tip safety guard to reduce chances of kickback included. Easy access fuel filter for quick maintenance. See-through fuel tank for simple fuel level checks. Fuel tank capacity 21.8fl oz. Some suppliers ship this fully assembled with scabbard, bar safety tip, T-wrench, chain and a small bottle of 2-stroke oil. An impressive list of features we’re sure you would agree, but if you want to know more about why they make this chainsaw one of the top-rated models for homeowners, farmers, and ranchers, then read on. Otherwise click here to find the best deal for the Echo CS-590 on Amazon. The professional-grade engine in the CS-590, whilst not the biggest we’ve seen in a chainsaw is certainly big enough at 59.8cc. With a top speed of 13,000rpm, it has enough power for good performance even when driving a 27” bar and chain, which is the maximum it’s rated for. The chain that comes with the model we’re looking at is a 20”, 3/8” pitch and 0.050” gauge version. It’s a professional grade low kickback chain with a corrosion resistant coating and square corner chisel cutters. If you want to check it out further, the exact model is the Echo 20″ Super 70 Chain, Part #72LPX70CQ. At 13.2lbs without cutting gear, this saw has an ideal weight for cutting larger pieces of wood without getting too fatigued. It does mean though that it’s not really suitable for extended use such as jobs requiring a lot of limbing as it’s just a bit heavy for that sort of job. The 2-stroke engine will require a gas/oil mix for fuel and Echo recommend a ratio of 50:1 using at least 89 Octane unleaded gas and 2-stroke oil. The fuel tank on this model can hold 21.8oz of fuel and is translucent (i.e. see-through), which makes it much easier to tell when you need to top up. Perhaps a little unusually for a top end chainsaw, this model does not have a primer bulb but to be honest, it doesn’t need one. The digital ignition and decompression device make starting very reliable with many owners reporting that it takes just two or three pulls to get started both from hot and cold. The way this works is that the decompression device reduces the compression force in the cylinder, making for much easier pulling of the recoil cord whilst the digital ignition provides for smooth firing and acceleration. There is also an integrated choke and throttle idle latch which makes the process even simpler compared to some other chainsaws. Check the user manual for the correct procedure and follow this every time for trouble free starting. Echo have developed an air pre-cleaning system on their chainsaws called G-Force that not only reduces the need to clean or change the air filter so often, but also helps prolong engine life. It does this by pulling larger particles of dirt and debris out of the air box before it gets to air filter using suction provided by the flywheel . We always recommend reading through the manual to get both important advice on safety and to find out how to properly operate and maintain the chainsaw. This model is very similar to most others in that there will be some regular jobs such as keeping everything clean and free of sawdust, especially the air filter and chain oiler areas. The chain will need constant checking for the correct tension and sharpness to get the best performance out your saw as well. There are some other regular tasks to do at longer intervals which can be found in a handy table in the manual. Like most modern chainsaws these days, the CS-590 has a number of built-in safety features to help protect not only novice users but the more experienced ones too. The main safety mechanism is the dual post chain brake which stops the chain in the event of kickback either through flipping the front handle guard forward or through the inertia created by the rapid movement of the saw blade. The Echo also comes with a removable safety tip for the bar which shields the area most prone to causing kickback. Other safety features include a chain catcher to help protect against a broken chain and some heavy-duty vibration dampening, which reduces much of the vibrations normally felt though the handles on a chainsaw. You can buy this Echo chainsaw fully assembled (check with the supplier), so you will just need to check the chain tension and that all the bolts are tightened up, then fill with fuel and chain oil. Otherwise, it’s just a case of fitting the bar and chain as well. In the box with the saw, you will find a bar safety tip, scabbard, T-wrench and small bottle of 2-stroke oil. The warranties provided with Echo tools are some of the best around and the CS-590 covers you for 5 years when used for residential or non-income producing use. For commercial users, the warranty period is reduced to 1 year. This chainsaw is proving very popular amongst those that need a heavy-duty model, suitable for use by professionals and experienced users. In fact, researching the many review sites we have found that over 90% of the comments are positive with just a few isolated issues. It will come as no surprise that we think the CS-590 is a great chainsaw in the right hands. It has lots of features and is built to professional standards, but comes in at a very reasonable price. Possibly not the best model for casual users with just a small amount of land to look after as it might have too much power and weight for the type of jobs they would encounter. Anyone else though who needs the rugged power and durability of a top end chainsaw should definitely have the Timber Wolf on their list as a top choice. If you think this is the model for you then you can find the best deal for this model on Amazon right now by clicking the button below. When it comes to chainsaws two of the most popular brands we usually turn to are Husqvarna and Echo, so it seemed only natural to pit a couple of their best models against each other in a head-to-head to see if there is a clear winner. The 20” size is one of the most versatile amongst all chainsaw models and we’ve picked the Echo CS-590 Timber Wolf and its nearest comparable rival from Husky, the 460 Rancher. Both these models offer a range of professional grade features and a rugged build quality that are perfect for homeowners with a large piece of land, farmers or ranchers. These are not the models for an inexperienced user to try, they are both too powerful and heavy but they will suit anyone who knows how to handle a chainsaw and has a lot of trees or wooded areas on their land so that they need something for all year round use. The first thing we’re going to check out is how they compare for features and specs, so let’s get straight on with that now. Air filter Heavy duty two-piece mesh. Tool-free access Standard quality. Tool free access. Commercial 1 year Residential 2 years. Can be extended by buying premixed fuel at time of purchase. Now that you can see the features and specifications of our two models side by side, let’s take a quick look at where there are differences to see how they compare. There is a full, in-depth review on our website for the Husky 460 Rancher here. Both our models come with similar sized engines that deliver the same sort of power. Where there is a difference is that the CS-590 has a top speed of 13000rpm which beats the Husky 460, so should do better at those demanding jobs where chain speed can make a difference. The chain spec is pretty much the same so not much difference there. The Echo and Husky can also both take different bar lengths but we think the maximum length is key here, so the Echo wins out again as it can take a 27” bar compared to 24” on the Husqvarna 460. Overall, the Echo seems to have a slight advantage in performance although they are very close. 2-stroke engines have always been temperamental to start, but both these manufacturers have done all they can to make this easier for the user. On the Husqvarna, you have their proprietary SmartStart system, a decompression device<link- http://www.woodweb.com/knowledge_base/Chainsaw_Compression_Release.html>, air purge and combined start/choke control which together does a good job of making starting not such a chore. On the Echo, there are similar features although it has no air purge bulb. Again, the reviews for this model point towards a history of dependable starting so it looks as though they have got things right for this model as well. As far as starting the chainsaw goes, these two are both pretty evenly matched so we’ll call that a draw. These days many high-end chainsaws have a system to pre-clean the engine air before it even gets to the air filter, which results in less maintenance and a longer engine life. Both these models have their own version of this and their systems do a good job. If you check out how each one works you will see that they are very similar, which is not much of a surprise. The air filter itself can be accessed without the need for tools on the Echo and the Husky which is a standard requirement these days for quick and easy maintenance. Echo have gone a bit further with their filter though, fitting a two-piece heavy-duty version that offers a greater surface area of filter material and is easier to clean. We prefer this design to the standard version fitted in the 460 Rancher so as far as air cleaning goes, the Timber Wolf comes out on top. Adequate protection against the sort of dangers you face when using a chainsaw is a given these days with a good chainsaw so it’s no surprise these two have very similar features. Where they differ a little is that Echo provides a couple of additional safety aids as standard whereas you would need to purchase these separately for the Husky. The items in question are the safety guard<link- http://extension.uga.edu/publications/detail.cfm?number=B1364> for the bar, which shields the area of the bar most prone to causing kickback and a spark arrestor fitted to the muffler to prevent hot sparks flying out which could cause a fire. These are both available as accessories of course but the fact the CS-590 has them as standard means it wins out in this category too. The Echo and the Husky both have vibration dampening systems which are a necessity with powerful chainsaws like these. Without this feature the vibrations felt at the handles would make prolonged use of the saws at the very least uncomfortable and at worst could even lead to a condition known as white finger<link- https://en.wikipedia.org/wiki/Vibration_white_finger> or HAVS. It’s difficult to judge which one is most effective as Echo do not publish the vibration ratings whereas Husqvarna does, so for that reason, we’re going to award this section to the 460 Rancher. This is one area where the 460 is a clear winner, coming in at around 0.5lbs lighter than the CS-590. That may not seem much but when you’re using the chainsaw for long periods through the day it can make a lot of difference. The CS-590 Timber Wolf wins this section as it has a much larger fuel tank that takes around 40% more than the Husky 460. Of course, that could be a double-edged sword as it means that when both are full of fuel, the Echo is going to be even more heavier than the 460, but overall, we think most operators will prefer a larger tank to keep them going longer out in the woods. Just to note, you can tell how much fuel is left in both these machines without taking the fuel cap off which is a bonus and something often missing from other models. Another home run for the Echo here it appears as you get a 5-year residential warranty as standard on the CS-590. Even commercial users get 1 year as standard as well. With Husqvarna however, their warranties are a lot shorter unless you upgrade them at the time of purchase. The standard for residential use on the Husky is 2 years but if you purchase some branded premixed fuel at the same time and on the same receipt, then the manufacturer will extend this to 4 years at no extra cost. Commercial users only get a 90-day warranty and there is no way to extend this. It’s pretty clear from the comparison above that the Echo CS-590 comes out on top and at the time of writing, it’s more competitively priced as well. 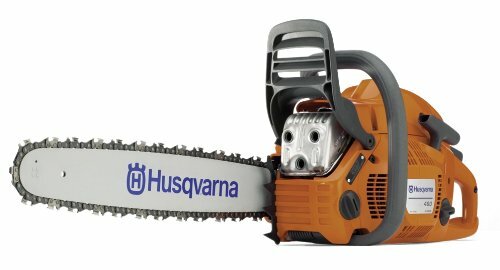 That’s not to say the Husqvarna 460 isn’t any good, it clearly is a great chainsaw and either of these models will serve you very well in reality. If you think one of these models is the one for you then you can compare their current price here.